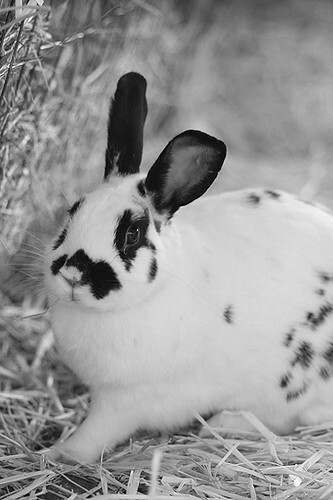 This is Iris of the I am a Spotted Bunny Clan. She is one of two rabbits at the sanctuary one can pet; the other permits a pet, then bites. 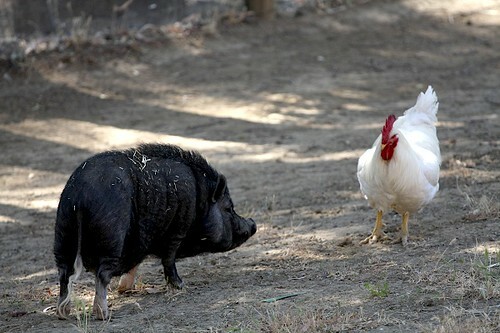 Matt, the rooster on the right, is too large to be with females (he can gouge their sides out/crush them) so he spends his daytime hours with potbellied pigs and calves. Bovines he could do without, but Olivia he loves. He called her over with his food call. He ate all the food but nice sentiment. Olivia ambled over, pushing her hair high into the air - in this case, a sign of "I like you" instead of it's other meaning "I challenge you to a duel" which she uses with the other pigs. With Matt, she's all hugs and kisses.